We offer Fluorescent Inkto our clients. Inks which glow in dark after sufficient charging by exposure to natural or artificial light sources – also fluoresce under U.V. Light exposure – available as neon colors with fluorescent daylight visibility and U.V. Sensitivity. Vibrant fluorescent colors are true vinyl inks which bond perfectly with limp vinyl. These inks may be intermixed with Vibrant Flat Inks Series to obtain color shades additional brilliance. Substrate: Vinyl Plastic, Vinyl Film and Vinyl Coated Material. Our company has been acknowledged for offering Fluorescent Magnetic Ink to clients. This product is used for crack detection by magnetic particle inspection under UV or black light in dark conditions. Offered range is made by using supreme grade basic material and pioneering techniques in tandem with market standards. Smoothline Writing Instruments Pvt. Ltd.
Good and result oriented Fluorescent inks in all colours. 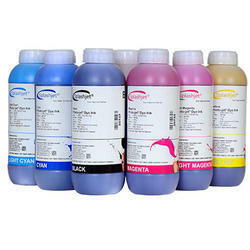 Owing to our state-of-art manufacturing unit and the usage of leading-edge techniques, we are able to present a comprehensive range of Dye Fluorescent Ink. 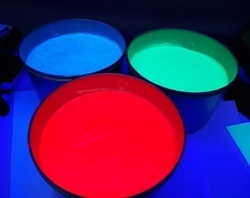 We offer complete range of Fluorescent Neon Printing Inks for offset, screen, heat transfer printing. We also undertake special matching in fluorescent inks. These inks are also called neon inks.